A memory matching game that uses sound instead of pictures, Sound Match is either kinda fun or extremely annoying depending on whether or not you’re the one playing. It’s an interesting concept, and I was actually kind of excited to try this game out when I first got it, but the novelty of the sound matching quickly wore off as a headache set in instead. They warn you that the game is best played with headphones on, and I imagine that’s because anyone without 50 yards of you may attempt murder if you play this game without headphones handy. Now, it’s possible that I only wanted to stab out my ears because I was playing a free version that only had cartoon sounds available, but in my defense, those cartoon sounds were remarkably obnoxious. Some of them weren’t so bad, like fun “sproing” sounds, but occasionally I’d get a clip of high pitched buzzing or maniacal laughter that even half a second of was just way too long. It works exactly like any other memory game out there. You have a set of tiles arranged in a grid. Touch one and a sound plays. Touch another and either the same sound or a different one plays. If you have a match, they both disappear, and the goal is to find all matches. You get a bonus if you manage to make multiple matches in a row, and there are different difficulty settings that affect the size of the grid. Additionally, the game is Open Feint enabled, so you can earn various achievements, but while you can pass-and-play, there is no online play option. From what I can tell, the free and premium versions are exactly the same, except that the premium version comes with all sound packs unlocked and free updates. The free version also has a few ads here and there, but not during game play, so if you are interested in trying it out, the free version is more than adequate for giving you a taste. The game interface is fairly intuitive and responsive, and the graphic design is remarkably bright and clean for a free app, but I personally have a hard time getting on board with a game that is so generally obnoxious, although I can definitely see kids loving this app. Provided you have a high tolerance for noise and don’t mind the cartoony vomit sounds, everything about Sound Match is kid-friendly, just don’t ask me to babysit if you’re going to let Junior play. 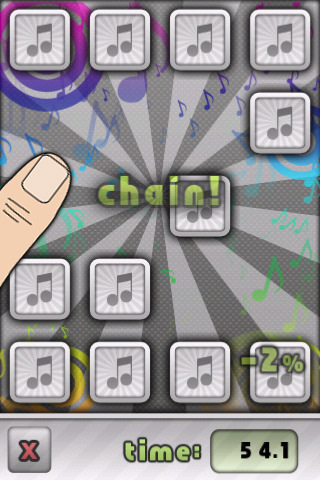 AppSafari review of Sound Match was written by Tracy Yonemoto on April 27th, 2010 and categorized under App Store, Free, Games, Multiplayer, Music. Page viewed 4179 times, 1 so far today. Need help on using these apps? Please read the Help Page.